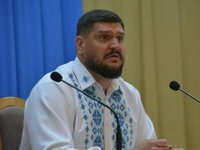 Head of Mykolaiv Regional State Administration Oleksiy Savchenko has submitted to Ukrainian President Petro Poroshenko a letter of resignation pending the probe into the suicide case of acting director of Mykolaiv International Airport Vladysav Voloshyn. "I submitted a letter of resignation on this matter and registered it today. It was registered on March 30, its number is 3231934301," Savchenko told journalists in Kyiv on Friday, demonstrating a handwritten document.